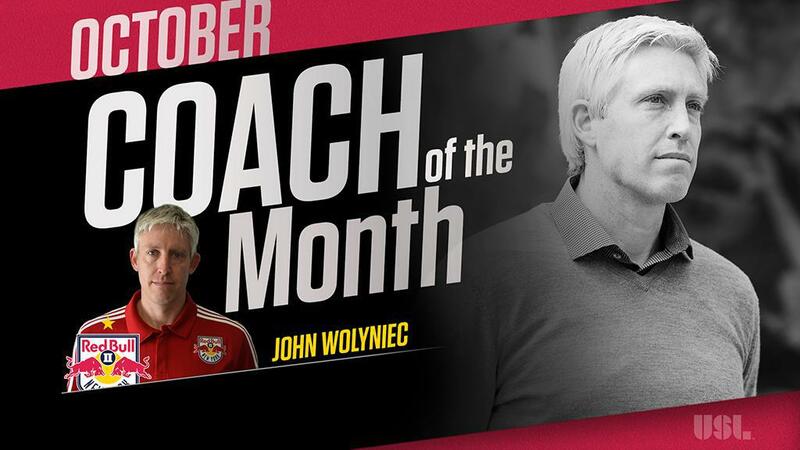 TAMPA, Fla. – The New York Red Bulls II’s John Wolyniec has been voted the USL Coach of the Month for October after he drove his side to three consecutive victories to conclude the regular season to first seal a place in the 2018 USL Cup Playoffs and then earn the No. 5 seed in the Eastern Conference. The 2016 USL Coach of the Year, Wolyniec has presided over playoff appearances in each of the Red Bulls II’s first four seasons in the league. This year the side produced a strong run of form to close the regular season as it won its first two road games in 2018 to wrap up its postseason berth with a game to spare, and then defeated Pittsburgh Riverhounds SC 2-1 in its regular-season finale to move into fifth place in the Eastern Conference. Overall, New York concluded its regular season with a six-game undefeated streak to set itself up for another postseason run as it looks to add to its 2016 USL Cup. Wolyniec received 44 percent of the poll to claim the award ahead Louisville City FC’s John Hackworth, who finished with 39 percent after also leading his side to a perfect 3-0-0 record over the month that saw the defending USL Cup champions ensure a top-two finish in the Eastern Conference for a fourth consecutive year. The USL Coach of the Month award is voted upon by the USL National Media Panel and the USL Technical Committee, with each group responsible for 50 percent of the overall vote.